It's one thing to see a bartender flip around a couple bottles, or a Benihana chef flip a shrimp into his pocket, it's another thing for a man to dance around the restaurant with a giant noodle. As the Foodbeast crew soaked up the culture in Suzhou, China, they made their way to the Haidilao Hot Pot restaurant, where they have table side noodle show. As is common in Hot Pot restaurants, you choose your own sauces, meat, and boiling broth that is brought to your table. Then you just wait for the show to start. 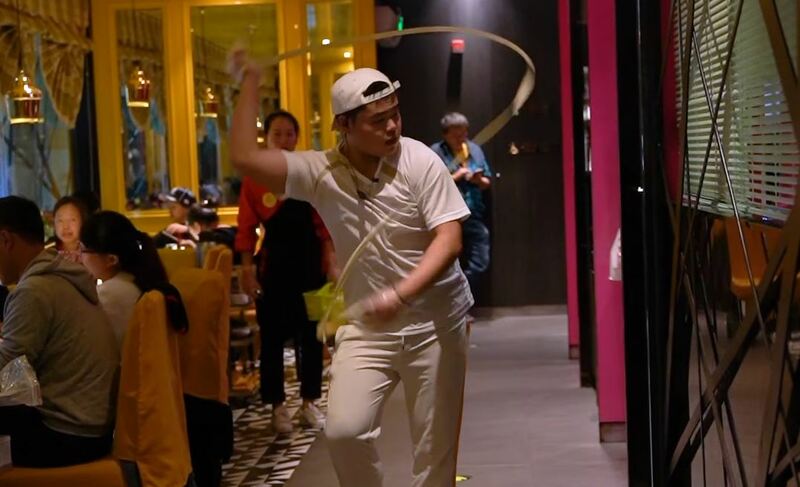 The noodle dancer comes through with a hand-pulled noodle the size of a jump rope, breaks into some Omarion-like moves, and carefully places the noodles inside the boiling hot pot at your table. Hot pot is quite an experience on its own, with the aromas of the boiling broth, surrounding meats, and flavorful sauces, but the added element of a dancing noodle-maker makes the spot even that more intriguing. While the Haidilao Hot Pot restaurants are primarily in China, there are four in the U.S., located in Santa Anita, California, Brea, Cupertino and Irvine, California. There are also plans to open in Houston, Texas and Flushing New York in 2019.